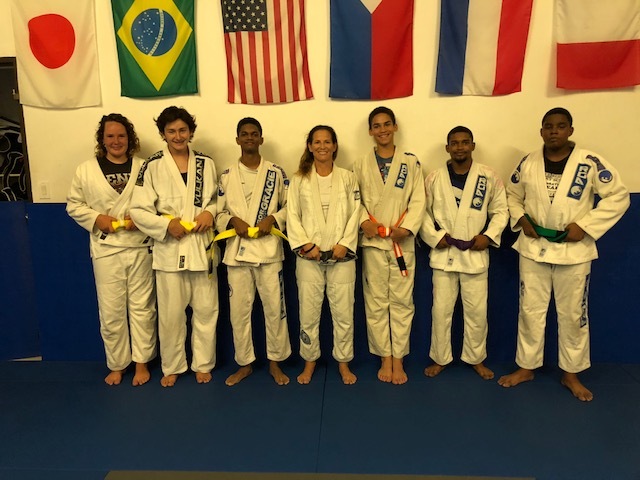 PHILIPSBURG — Renzo Gracie St Maarten (SXM BJJ) Coach Jami Eloi was promoted to the rank of purple belt in Brazilian Jiu Jitsu on Wednesday June 20th by Head Instructor Melissa Bardfield. 20-year-old Jami Eloi is an assistant coach to both the Brazilian Jiu Jitsu and Muay Thai (kickboxing) kids programs at SXM BJJ. Jami has been studying the art of grappling with Renzo Gracie Black Belt and founder of SXM BJJ, Melissa Bardfield, since 2011. Jami earned his blue belt is 2014. Shortly after his promotion he competed in the 2014 IBJJF World Championships in Los Angeles taking bronze in the Juvenile blue belt category – making history as St. Maarten’s first world champion medalist. SXM BJJ holds its main promotion ceremony and demonstration each year in December, the June ceremony helps recognize the continued progress. Students demonstrated skills and sparring in front of family and friends followed by promotions. Most students were awarded stripes but a handful of students, including many students who began training Post-Hurricane Irma earned new belts. New White/Grey belts include: Brandaen Illis, Khloe Cheng, Damian Cheng, Selah Romney, Nahjae Prince, Eldrick Phebe, manuel Martina. Grey: Izaiah Willems, Ziro Degrammond. Grey/Black: Kzar Williems. White/Yellow belts: Grace Cheasley, Paul Ten Broeke, Thomas Ten Broeke, Kyle Lake, Isiaih Arrindell-Peterson, Nico Florea Hassell, Neil Jederon, Nakysha Jedreon, Sacha Leal, Moises Martina, Savanna Ortega. Yellow: Renard Brison, jet Fleming. Yellow/Black: Seybian Ortega. Orange/White: Derek Matser, Aiden Wilkie. Orange/Black: Omarion Thomas. Green/Black: Kleyian Carter. The passing of Hurricane Irma in September dealt a hard blow to the academy physically- breaking windows, water intrusion, roof damage and disrupting power and water for weeks, and sending many students off island. The school was able to reopen as soon as water was restored on September 25th, less than 3 weeks after Irma. Due to the difficult times, attendance initially dropped significantly. Over the course of 2017, students thrived and were able to able to have a safe place to let out their stress and avoid depression. 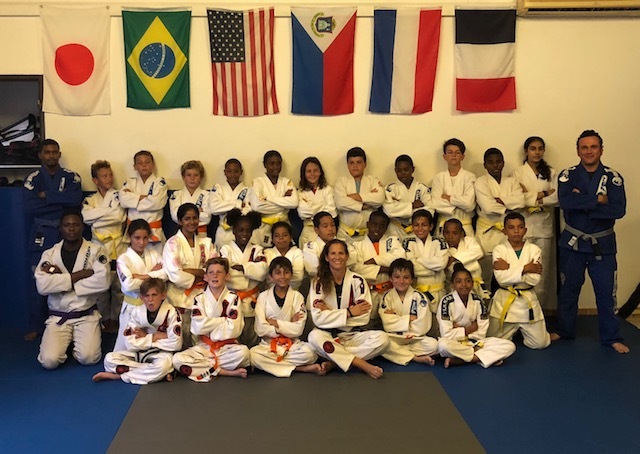 The closing of the school year marks a significant milestone for the martial art students, proof that Sint Maarten is on the road to recovery. Although the program for youth pauses for the summer vacation, all adults/age 14+ classes still will continue through the summer, closing only from August 1-19. All kids classes resume September 3rd. Belts in Brazilian Jiu Jitsu are awarded based on competence; there are no official belt tests. Adult belt ranks are white, blue, purple, brown and black. Only recognized Black Belts are authorized to promote belt ranks and stripes. Extra belt colors are awarded to children beginning from white/grey, grey, grey/black, yellow/white, yellow, yellow/black, orange/white, orange orange/black, green/white, green, green/black. Only after the age of 16 are students eligible to receive a blue belt. For more information on Brazilian Jiu Jitsu classes please call 721 544-4444 or email info@sxmbjj.com.